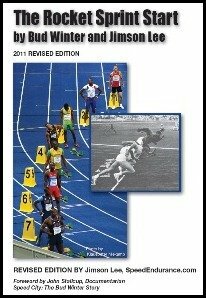 The Rocket Sprint Start, 2011 Edition, now Available! In 1964, Bud Winter published the book The Rocket Sprint Start based on Germany’s Armin Hary 100 meter victory at the 1960 Olympic Games. If you’ve seen the vintage footage, you will agree on two facts: (1) he was one of the fastest starters of all time, and (2) his pickup in the first 20 yards was amazing. What did he do differently? A careful film analysis of Armin Hary’s form, taken from slow motion pictures, revealed seven ways in which his form differed from the rest of the sprinters. In each case they were all a definite contribution toward faster block clearance and faster pickup. Bud Winter pioneered modern Track and Field, while creating the “Science of Sprinting” with his thorough, step by step detailed analysis and scientific studies. Almost 50 years later, The Rocket Sprint Start book has been revised for the new millennium. Like So You Want to be a Sprinter, this 78 page book is available in two formats, a perfect bound spine and the spiral bound “Coach’s Edition”. The regular price is $21.95, but on sale for $19.95 for SpeedEndurance.com readers until Friday December 9th. This book also makes a great Christmas present for any coach or athlete. Why pay hundreds of dollars for the out-of-print book at eBay, when you can get the latest updated 2011 edition today?